Tori Erskine and her partner head to Brasserie 1699 at The Townhouse in Chester to sample afternoon tea. Photos: Tori Erskine. Anyone who knows me will know that I am an avid tea drinker. It’s probably the Irish blood in me, but I basically cannot function in the day without a cup of tea. You can imagine my excitement then when I got the chance to go along and have afternoon tea at Brasserie 1699 in The Townhouse, Chester. When I visited with my partner, Chester had turned into a Winter wonderland, covered in a blanket of snow, so when we phoned The Townhouse to let them know that we may be a bit late, they were really understanding. But we arrived in the nick of time for our reservation and were sat by the window overlooking all the gorgeous buildings on Bridge Street as the snow fell. Talk about an idyllic setting. Our tea arrived promptly, and then out came our tray of food. Arranged beautifully on a tray stand made of wood and slate, the rustic effect made for a bold, yet very pretty display. Instantly our eyes were drawn to the bright mini colourful cakes on top, because what’s afternoon tea without tea and cake? We tucked into our sandwiches first of all. I don’t think myself and my other half have ever felt so sophisticated as we dug into cucumber finger sandwiches. One of the ways to my heart is salmon and cream cheese, so this was undeniably my favourite. The salmon was perfectly smoked and fresh. Finally we were ready to delve into cake and scones, and if there’s one thing that I enjoy drinking as much as tea, it’s a crisp glass of prosecco. Prosecco and cake is, for me, a perfect combination as much as tea and cake is. It’s admittedly one of my drinks of choice, so it was a fabulous treat along with the afternoon tea. The selection of treats were perfect for all cake lovers out there, whether it’s a lemon meringue, chocolate or marzipan that takes your fancy. For me it’s banana cake, and I instantly fell in love with it, along with the mini macaroons. We literally couldn’t have asked for a more perfect setting than The Townhouse. Overlooking the gorgeous Bridge Street, we sat inside feeling very cosy surrounded by wonderful food and drink while we looked out at the snow. The Brasserie 1699 has just had an impressive refurb, and when you walk in you’ll definitely want to lounge on the attractive blue sofas. The staff are also amazing too, so friendly, attentive, making sure we had everything we needed. 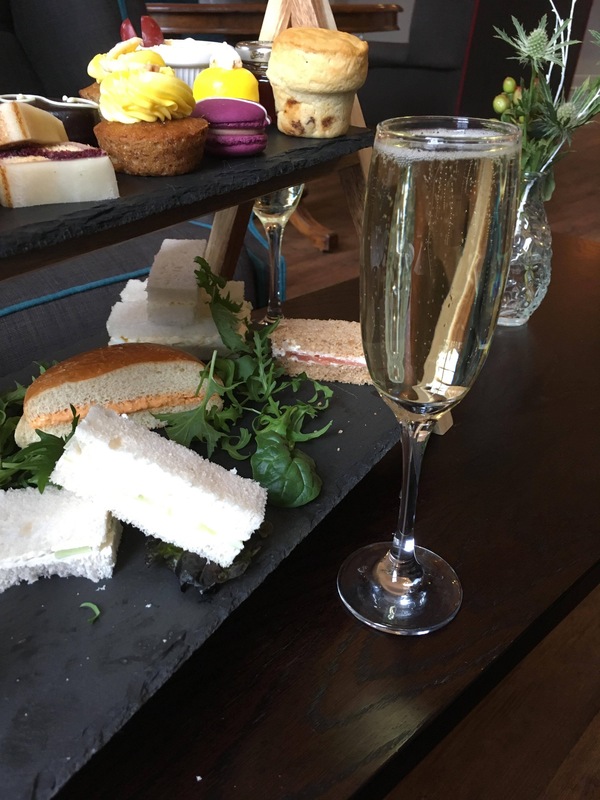 Afternoon Tea at Brassiere 1699 is the perfect way to catch up with friends, or even an alternative to your usual coffee trip, and with a glass of prosecco thrown in, what’s not to love? If you head over to their website you can find out more about their range of afternoon teas including their Bottomless Afternoon Tea, where for £29.95 you can have afternoon tea and unlimited prosecco for two hours*. I will definitely be returning for this. Disclaimer: We were given complementary afternoon tea by Brasserie 1699 for the purposes of this review. This, however, does not affect our integrity and editorial judgement when it comes to reviewing products or services for We Are Chester. We pride ourselves on our integrity as bloggers and journalists.